For adding new Portfolio go to your site admin and navigate to Portfolio > Add New. It’s similar to adding a new post. 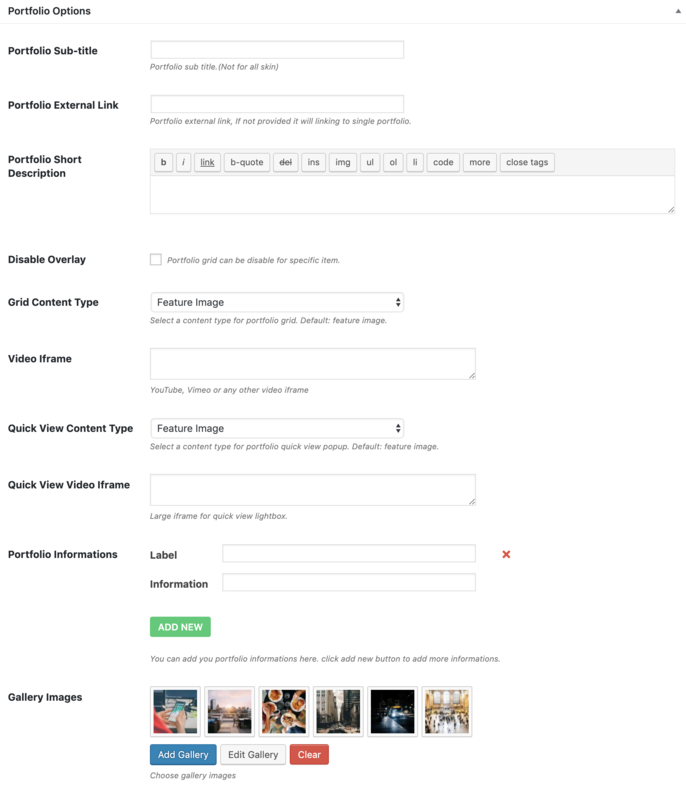 You have to write portfolio title, set feature image which will be shown in the portfolio grid by default, portfolio content which will be shown in the portfolio quick view popup area and single portfolio page, portfolio categories which will be used for portfolio filtering navigation. You will see a portfolio options box below the content area, like the screenshot below. If you set an external link in the portfolio option the portfolio grid link icon will be linked to this external link otherwise it will be linked to the single portfolio page. By checking the disable overlay checkbox you can disable the grid overlay which comes on mouse hover ( For Image Background and Hover Effect Skin ). You can set content type for the grid and quick-view popup, you can set video Iframe as well. And you can add a portfolio image gallery, which will be shown in the quick-view area. The gallery can completely disable form the portfolio settings.